The look of burlap has become quite popular for home decor. 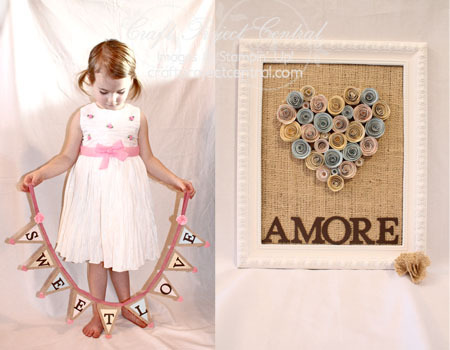 Here are two tun Valentine projects that will bring the shabby chick look of burlap to your decor. Each pennant on the "sweet love" banner is burlap with designer paper stitched on top. Accents of glittered hearts, dyed ribbon and paper flowers finish off the banner. The framed Amore art piece really pops with rolled paper roses. These two coordinating decor pieces would really show someone how special they are to you or would be a great addition to your own decor this Valentine’s Day! This gorgeous decor set was created by Carrie! If you have a chance please stop by Carrie's blog and let her know how fabulous her project is!